We have Dragon Scale Bettas at the LFS here. They tend to have thick scales that tend to be shiny although I am seeing this less and less. Also the scales apparently can grow over one eye or both eyes blinding the fish completely. The one I saw today had one good eye and one seemed clouded or maybe it was a thin scale over the eye. Does anyone know about these Bettas? As in it maybe being a case of trying to breed for characteristics that backfires when it leaves the fish blind? We have recently done what I believe is an informative Betta care infographic and think it would be a superb addition to your article (or even great to use for a new article - where I'd be happy to help with some content to go with it). Let me know if this is something you'd be interested in and I'll send you over the infographic. Hi all! I suppose I'm directing this question at Bob, the resident Betta expert...but I'm confident that any of you guys know the answer. On a recent blog, I mentioned a horrible incident (I shudder to think of it) in which all of my female Bettas got their heads stuck in an ornament. It truly was like a scene from a fish horror movie. One was dead, two still alive but stuck so badly that I literally had to shake the ornament with force to free them. One was too far gone and I decided the other, after observation, was as well. So, I used clove oil to euthanize them. pretty much mentions this need from the start, I wanted to ask you all what your take on this is. Thanks in advance! You guys rock!! <There is less obligative need when younger; but as far as I know all Betta spp. are aerial respirators as adults. Ahh, thanks Bob! May I use your expertise (vicariously) to gloat?? Nah, just kidding! By the way, I purchased your book on Bettas last year...enjoyed all the information and left you a nice review!!! What r these orange balls in my female Berta's bowl? It also got very cloudy overnight. This water needs to be changed out ASAPractical, and this fish put into a proper environment. first of all I´d like to thank you for your great homepage! One week ago, I purchased a beautiful male Betta. He lives in a 25l (6.6 gal) tank (cycled, filtered, heated, planted). NO2 = 0, No3=5 mg/l, pH= 7,5, KH= 5°dH, GH= 9°dH, Temp. 26°C. He is fed alternately with a variety of flake foods as well as live or wet frozen mosquito larvae, Daphnia or Artemia (small amounts once per day) and so far, he´s doing fine. Still, I have two questions: 1) the only cohabitant in this tank is a brown Planorbarius corneus. Since about two days, the Betta is frequently flaring at the snail. Is this too stressful? Should I remove the snail? 2) It´s not my first aquarium, but my three other tanks are much larger. In there, I do 25-30% water changes once a week. Should I do more frequent partial water changes in the Betta tank due to its small volume? Bob A local online forum http://www.arofanatics.com/ has teamed up with the Betta club, Ranchu club and Pleco club to set up this year's carnival. Attached are the pics of prize winners from the Betta show. Bob Sorry about the fuzzy image. I only had a cheap digital camera with me yesterday. I have a question about shipping Bettas or any fish. I have a friend who would take a Halfmoon Betta that I have, but they live far enough away that I would have to ship it. So I looked up info on the net about shipping fish, and one of the things that needs to be done, it seems, is using a tank and hose to slowly put oxygen into the bag, much more oxygen than water, and ship with the right insulation and box etc. Do fish breeders buy tanks for this purpose?? It seems as though fish shipping is only for the breeders who are known and selling a lot of fish. So it looks like shipping one fish is too pricy. What kind of tank do breeders use? or do they rent them? or go to a place somewhere where they pay to have oxygen put in the bags?? I didn't know it was quite that complicated. I also read that most breeders do the two day shipping which is more stressful for the fish. I love your site, and have used the FAQs many many times while setting up all of my fish tanks. (a 50 gal coral/saltwater a 15 gal freshwater, and a mini 5 gal biocube) Your knowledge base has been a huge help for me over the years! Anyway, my latest project is a 2 gal bowl (tricky, I know) to go on my coffee table in the middle of my living room. After some research I decided the star the show would be a male Betta fish. I came across this little guy, a super delta Betta if I'm not mistaken, in the pet store and I was simply smitten with his personality - even in those horrid little cups they keep Bettas in at the pet store, he swam around as much as he could and does this delightful little shimmy dance whenever I feed him. His body is a silver-grey, shiny, with black lining on his scales. His fins are gorgeous with uneven streaks and specks of black throughout. The first 1/2 inch of fin is a shiny silver, fading into a jagged 1/8 inch band of bright, shiny white which kind of reminds me of pictures of butterfly Bettas I have seen. The band of white looks frosty, almost jagged and ripped up, but it leads into a band of clear/cellophane at the edge of the fin which is healthy and unmarred, and all of the fins and scales flash bright as tin foil when he swims. I can never seem to get a photo that does him justice (he always ends up just looking grey), but I will include one anyway. All of the websites I have looked at on Betta coloring have lots of information on black, red, blue, green, albino, cellophane, etc., but none of them have anything to say about Bettas as shiny and silver as this little fella. Any of you Betta geniuses out there know what kind of breeding strain his silver would have come from? 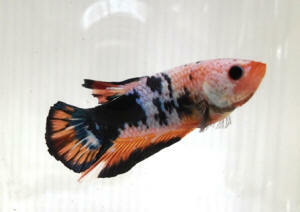 Or his tri-colored fins? While I'm here, do you have any recommendations for safe tank-mates? I know more fish are out of the question from the size of the bowl, but what about snails or small shrimp to help keep the substrate tidy? I also am considering switching my fake plants for live ones, but I have heard mixed reports - any tips on a good plant for such a small space? Should I just stick with the fake ones I have in there? So is it possible to keep a Betta in a vase. My family kept Betta's in vase and they survived for a long time. <Some smoke cigarettes and don't get cancer; doesn't make smoking safe. through them all: poor living conditions, specifically, bowls and vases. Ask yourself why you're trying to keep an animal in conditions any vet will tell you won't be humane or healthy. If you want an animal companion, find one that will work in the space and budget you have at your disposal. I am simply providing you with information that I know. Once again I am personally a first time pet owner. <And I'm not. I'm very experienced, and I care deeply about animal welfare, hence my firmness. I was going to write this up later but saw a post that I'd like to comment on. If you think better for BB let me know. I don't expect a play by play response by any means because a lot of this is editorial but there are a couple questions at the end I'd like opinions on. In the US (proper English) "Betta" is closer to beta and nowhere near "beater". I sat in with a class at Microsoft Reading (after I was stymied by the fact that the elevator had a "0" floor. I had no idea what button to press) and heard "rooter" for "router" for the first time. Where ours is more like "pouter" or "doubter". I think this is what was behind the war of 1812. <Ah, this has nothing at all with the differences between British and American English. At this point, let me remind readers I'm not a Euro-snob. I don't regret getting into the hobby though it is quite like a drug in the sense that the dealer gets you hooked on something cheap and you have to keep going back for more stuff. No retailer here is going to recommend a fishless cycle and my tank was cleared by the big chain because it didn't have ammonia, nitrite or nitrate after four days. Of course it didn't! It didn't have anything organic to get these processes going. But even my big fancy LFS is cool with fish stocking as long as you don't more than double your stock every week or two. Hadn't heard that rule before. What I'm saying is there is frustration like the fact I have different species recommended by the LFS after the infamous tetra incident. They didn't make more money on me by selling me the fish they did. <I think Bob and others here would agree with your observation. Retailers who provide bad advice ultimately lose more customers (and profits) than they create. Most every retailer in every hobby is against this problem, the one of short-term profits against long-term customers. People starting out in hobbies tend to be [a] cheap and [b] ignorant, so selling them less expensive gear and instant gratification often works well in the short term. But in every hobby you'll hear stories about people who started off in that hobby, hitting a couple of failures, and then giving up. I think this is one reason online retailers do well, because they don't care, as their catchment area is national. Brick and mortar retailers on the other hand really do need to cultivate their local catchment area of customers. On the contrary, I was very impressed that they would give me recommendations by e-mail when I could have gone somewhere else with the info. I respected that and I still respect them but mostly on a relative scale since no one mentioned the importance of matching water hardness until everyone was home and comfy (comfy accept the Pearl). So I'm determined to make it work. The tank came part of a kit for only $130 with heater, HOT filter, light hood and sample potions and food. Usually the rule is whatever comes as part of a package deal probably isn't the best around and I was not impressed with the turn the dial "set and forget" heater. But here's the part that kills me. Or almost kills the fish. Or really doesn't but bear with me. The filter that came with it was the Aqueon Aquarium Power Filters 55 which doesn't have a great review rating at the big sites (average probably about 3.5 stars). It is floss with carbon and a comb thingy that does some mechanical filtration and captures bacteria so you don't re-cycle when changing the filter cartridge. Cons with this are it has an electrical hum to it that almost sounds like you forgot to ground a turntable (whatever those are). The water fall is quite loud and I remembered after it was too late why I didn't like those water fountain decoration things. Frankly, they make me want to produce my own ammonia if you know what I mean. After I discovered this site I began reading the daily FW FAQ every day and occasionally general which I did today. That's when I saw the post about sudden tank deaths and it appears that the poster is probably using an Aqua Clear Power Filters by Hagen which unfortunately has the somewhat proprietary system that you advise against from a cost standpoint though it's still pretty cheap versus a fish and chip order (but not in front of the tank and what the heck putting fries on a pizza?). After doing the requisite reading here (you really should have a counter that ranks newbies by how many articles they read) I decided since my tank was cycled (it wasn't) that I would switch from the Aqueon to Aqua Clear because I liked the idea of changing the media in stages, the ceramic thingies were geeky enough, AND most important no carbon in case of sickness. I would take the comb thingy from the Aqueon to seed the Aqua Clear since the tank was cycled (it wasn't). Now, what I found out was that if not perfectly balanced the lid would vibrate insanely and priming this thing can be a real headache. It won't re-prime itself after a water change or a power outage and that concerns me. But things really went bad the other night after doing a 25% water change I was having trouble getting it primed and pushed down in the wrong place. The gunk that apparently could not be shifted into the sponge came rushing out the top in a lovely brown liquid with huge fish scales (Gourami?) and even a dead fly. <The brown liquid is good, actually, and means the filter is doing its job. The tank was awful. This was after waiting for the little floating stuff to get picked up by the filter which hadn't finished even after water changes after a week. Things weren't cloudy just not pristine. When the overflow happened it got cloudy and ironically it was the first time the water tested positive for nitrite which I had tested before the water change. It's like all the bacteria got stuck underneath the fish scales and crud and couldn't make it out to the tank. So after an emergency water change I decided to stick the "old" filter back in but in my panic I forgot to prime the carbon. I set the Aqua Clear on low and moved it to the other side of the tank. 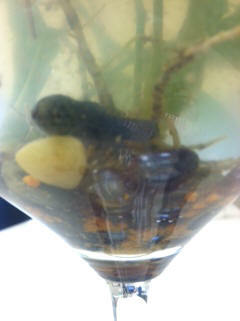 What amazed me was that within two hours the water was nearly crystal clear and the nitrites were gone. Though this was a sign of the cycle being broken it appears to be back tonight. One of the things that I may not have taken into account was that the Aqueon is a model "55" for a 36 gallon which I think is the same size as the other poster. This model moves 325 GPH versus 200 for the Aqua Clear. I wanted the Aqua Clear to work. It just made more sense. And I assume that the floss and water travel of the Aqueon is what is working better versus the carbon which both of them have when configured properly. I plan on leaving the Aqua Clear in there through the cycle or at least for a bit because I think I should have a Gourami prison tank (I mean quarantine tank) considering the amount of bullying I've seen with two different species and the fact that there are four different kinds in there now with 17 fish total. It seems it's just a matter of time before needing one for sickness and I have many redundant parts now. My questions probably are best summed up with floss versus sponge and does what I describe above make sense or did I perhaps get a dud on the Aqua Clear? I'm sorry this is so long but I wanted you to know there are some new hobbyists that are trying to follow your good advice but there is so much conflicting data and backfires out there. After all, we all seem to trust a company that sells great food or equipment or test kits but then also find out that the magic potions for speeding up cycles etc are just snake oil (eel oil?). <Actually, there are some products that can help with water clarity. I'm sticking with it and no fish have died without my permission. Looks like the cycle is settling in finally and I'm sorry that 17 fish have to bear it. If cars were like this I think they'd keep going when you hit the breaks. -Frustrated yet grateful in Charlotte. Oh I think we now have three pronunciations of Betta. Your correction wasn't the version I was expecting. Thanks for that. I don't think the big chains here make money on fish replacement or at least right away. The LFS actually makes you prove good water before giving you a free replacement but the chains don't care. If it dies in two weeks they replace it. So in that sense they are selling the fish cheaper and guarantee it will work. At least eventually. I will give them credit too that they do hand out some guides written by the chain on how to get started just not the best. Honest, they have a couple full time fish people on staff tending the area all the time and there's no way their salary is being covered by the fish. Well maybe higher end chain stores with salt water species where you can get a "Nemo". The water overflow into the tank was my fault. I just didn't understand what the reaction would be until it was too late. Still, it was almost embarrassing that after two weeks the Aqua Clear couldn't clear the tank as fast as the "inferior" Aqueon which did it in two hours. I almost added "just tell me what to do Neale" at the end of the message but didn't want to sound bitter. I'm not. It just seems to do this right you need secret codes, passwords, handshakes, and friends in high places. The easiest way might just be to be ignorant and blame mother nature when killing your own fish with ammonia. Two more things about the retail stores. If you did come in with high ammonia or nitrites I am convinced they would tell you to do a water change. It's in the documents they hand out. That would give them the chance to sell what you need for the change and indeed they sold me that stuff upfront. What I think they are up against more than profit motive is the adage that the customer is always right. Let's face it Neale, if you worked at Pet* here in the US and told people they were guilty of killing their fish like you do here, I don't think you'd sell that many fish. It's easier and appears to be better customer service to apologize for defective fish that weren't defective, replace them and try to sell a water changer kit at the same time. Most people come in with pre-conceived notion of what they want and in retail if someone asks for a red sports car without the skills to drive one, you still sell them a red sports car. And even if they were evil, which I don't think they are, they do introduce a lot of folks to the hobby that are coming by for cat food. I know this for a fact :') I would have adopted a kitten that night if it wasn't for the paperwork. Now me and the cat have our own chairs that we sit and watch the fish together. She's a teenager now and you know how hard it is to get quality family time and since the tank is widescreen maybe she thinks it's just HDTV with really good reception. I hope someone benefits from this discussion about filters. My main point is the banging of the head on my desk with all these forks in the road. I'll look into canister at some point. That's on my list but as a primary system it sure isn't cheap for the same GPH. Besides I have 1000 articles to read here on the subject. Thanks again. Heading to BB soon with irreverent fish observation stories! fish that I believe is a female, as she is gold and not very pretty, but not sure. I a seeing and has this small white thing sticking out where I believe she goes to the bathroom? <Goes to the bathroom? I love Americans; they're so wonderfully prone to euphemism for normal bodily functions. I'm visualising a fish jumping out of an aquarium, running up the stairs, sitting on the loo, and wiping its backside with toilet paper. Anyway, I suspect you mean its genital pore. Please help, I want to save her if possible. Thank you so much for all the helpful info. I read over your section on Bettas and found myself nodding and smiling along as I read. I currently have 2 female Bettas, Betty and Mickey. I must say that I love the female Betta temperament. They love people interaction so much! I even got my sister-in-law to get a female for her community tank, and her Betta loves to be "petted" like a dog or a cat would! My first female Betta, Betty, is in our 55 gallon tetra tank for a few more weeks, but she is getting moved to her own 5 gallon tank shortly. This is because the other female Betta, Mickey, was a bit aggressive and started nipping. To solve the problem, I moved Mickey in with the guppies in a 29 gallon tank and shortly thereafter noticed perfectly sized, Mickey-shaped bites out of THEIR tails. To make a long story short, Betty gets her own home, Mickey will live wonderfully with the tetras, and the guppies' fins and tails will begin to heal. Everybody will be happy. I wanted to thank you for the wonderful section you put out about the Betta in general. Mickey is wonderful at keeping down the snail population in the tetra tank. My fiancée observed her coaxing a snail shell off the side of the tank, sucking out the snail and eating it, then letting the shell fall to the bottom! I wish I could have seen that! Just think: for her, it's a daytime treat! Thank you for the wonderful site that you have started. It's great to have a resource like WWM to visit when I am not sure what is going on with any one of my eight tanks. In a 2 bedroom apartment, any area that does not have furniture in it has a tank in it! I have been searching your site, trying to diagnose what is wrong with my Betta, Sparky, and have learned much helpful information. I just wanted to express my appreciation for the sensitivity, care and respect (and also the humor) with which you answer everyone's questions and concerns. It is obvious that you are sincere in your love for Bettas, and in your desire be of as much help to them, and their caretakers, as possible. Thanks for being out there and for doing what you're doing. Lisa. My fish is a Betta. It has pop-eye. I've spoken to several different people every time I email ya'll. So I am never too sure who is going to get my email, so I leave it open for anyone. I am sorry. <<It's ok Renee, but all is still posted on WWM. Lisa>> Now will you please help me? Renee. 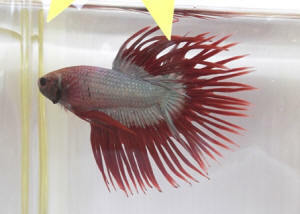 Re: Age of a Betta and male's tail Fin Hi Chuck, Thanks again for your reply. I have a question about how to find out what age my fish can be. If I measure the length of my male Betta's body only, he is 2 inches and my female is 1.5 inches. Is measuring the body only of the fish a good way of determining its age, if so what age would you say my fish are? Or how could you determine its age ? < In the wild the seasons have cool and warm periods so you can look at growth rings on scales. Really no way to tell on captive aquarium fish. Bettas are turned very quickly at aquarium stores so you can probably assume that the Betta was around 6 months old at the store when you bought them.> ------------------------------------------------ Second question has to do with my male fish, his tail fin as a "U" shape tail and in the middle it as decolored with little lines (tares in the fin), it is small now. I do not have a digital camera to take a picture, therefore I draw one (See Attachment), the decolor is some what a off-white color. I add some aquarium salt to the water after each change (100%) every 3 to 4 days. Any suggestions on what it could be and if I should treat it now ? If so with what ? 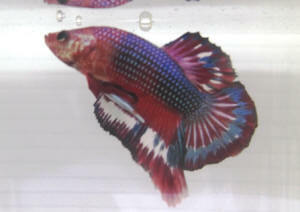 < Some Bettas are bred to have a split tail. Look on the internet for pictures of fish with tail rot and see if the photos match your fish. If that is the case then do a 30% water change and service the filter if you have one. Treat with a Nitrofuranace type of drug and follow the directions on the package.-Chuck> Thanks, Mario D.